Over the years, Chinese smartphone manufacturers have built up a reputation for offering devices with oodles of performance at mouthwatering prices. 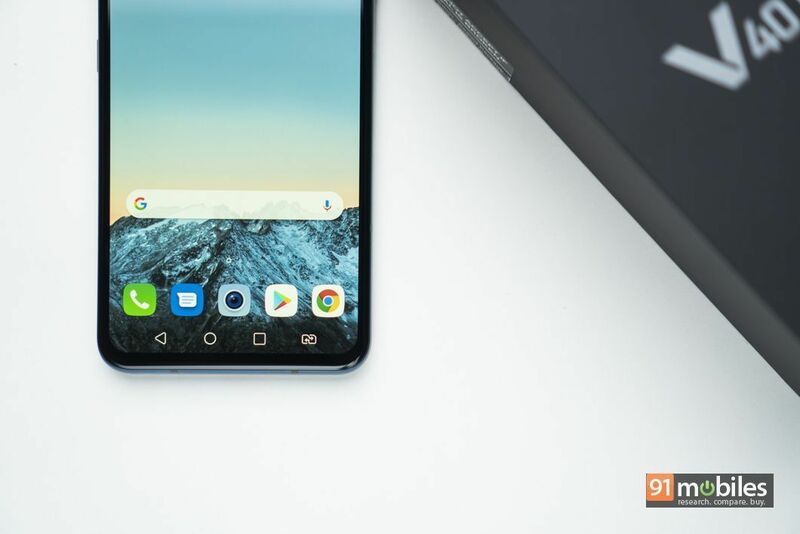 However, in my books, the closest a smartphone has come to replicate the ‘flagship experience’ at a wallet-friendly price is last year’s LG G7+ ThinQ (review). 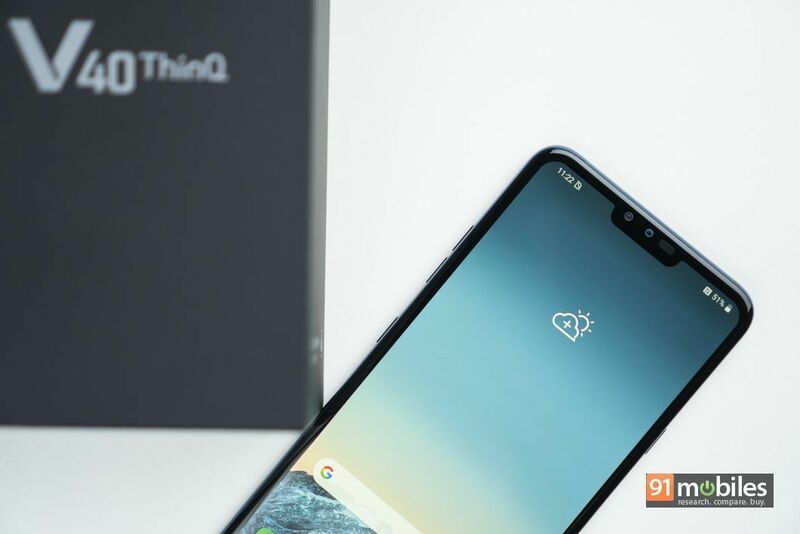 Recently, the company announced the availability of the V40 ThinQ in India, which in a nutshell, is a bigger, beefier version of the G7+ ThinQ. Although the smartphone has been priced rather competitively in India (Rs 49,990, in case you were wondering), it has its task cut out as newer flagships with speedier SOCs are just around the corner. While it’s too early to say if the smartphone makes for a good buy, my initial impressions of the device are extremely promising.  Read on to know why. 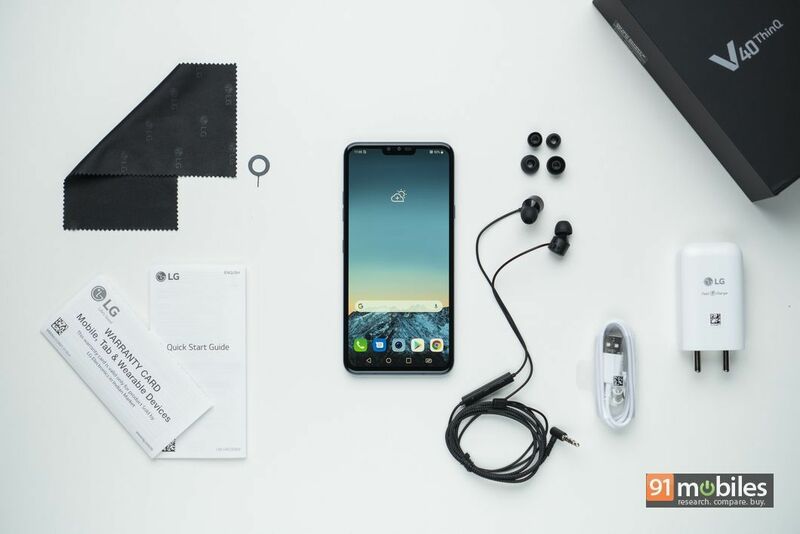 The LG V40 ThinQ comes packaged in a black cardboard box, opening which buyers will find the smartphone itself followed by some documentation, a quick wall charger, a USB Type-C cable, a microfibre cloth and a pair of in-ear type headphones. Unfortunately, the device doesn’t ship with a protective case and therefore, buyers will have to purchase one separately. 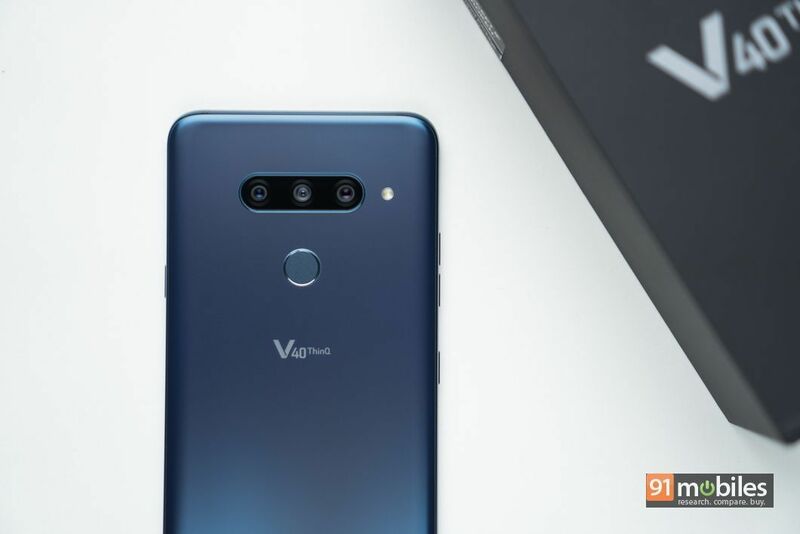 The LG V40 ThinQ sports the same design language as its predecessor and has been constructed using a mix of glass and metal. 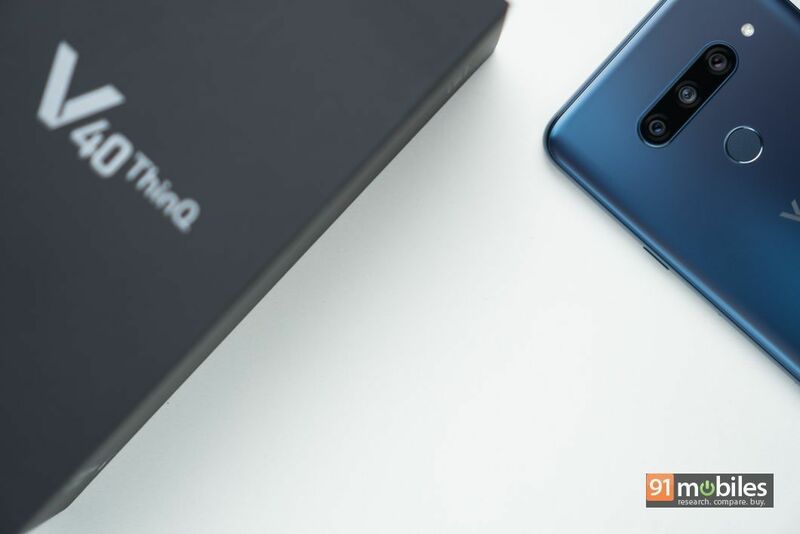 However, unlike the G7+ ThinQ which sported a rather compact form factor, the V40 ThinQ is a tad bit wider and consequently, not as one-hand friendly. That said, the smartphone ships with a vibrant gradient finish akin to what you might’ve seen on phones from Huawei, doesn’t weigh a ton and isn’t as slippery as either. Unfortunately, the gradient finish still attracts a ton of fingerprints which is why the company even bundles a microfiber cloth with the retail unit of the smartphone. As far as my first impressions of the design are concerned, I was quite satisfied with the overall look of the handset. 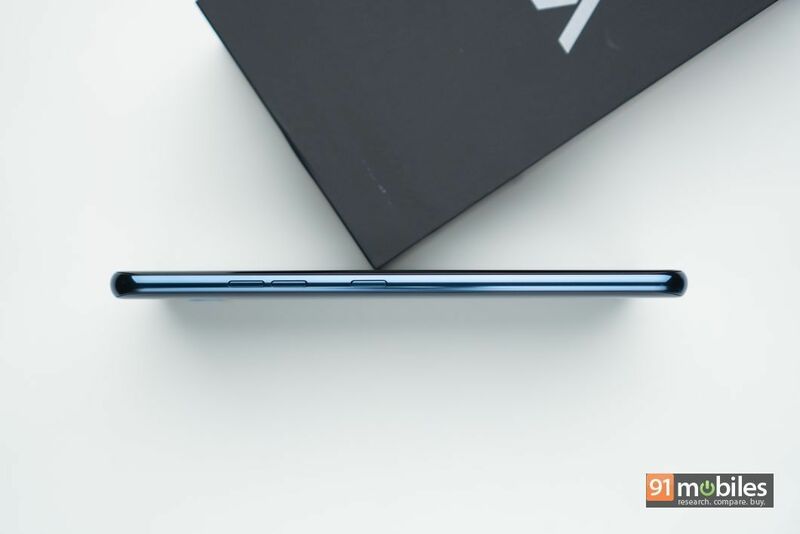 The beaming blue hue looks fantastic and the smartphone feels every bit as premium as its more pricier competitors. 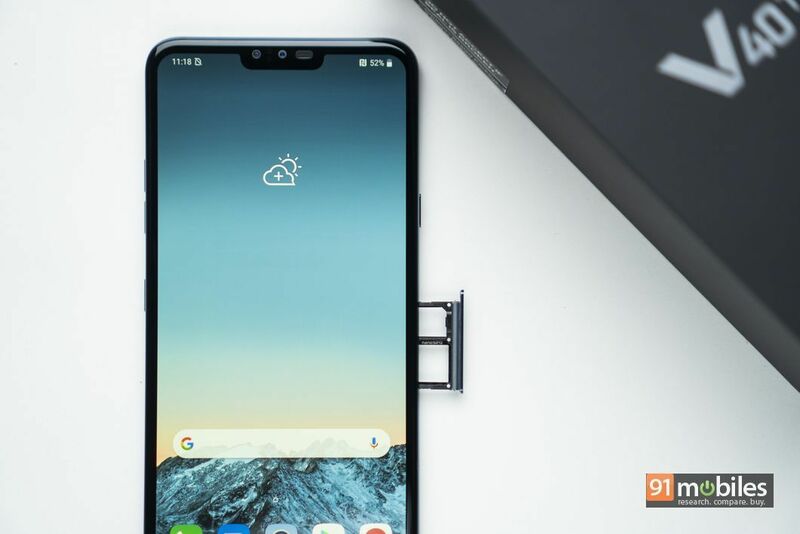 Add to that support for wireless charging and the smartphone’s IP68 certification, and the V40 will undoubtedly stir up the flagship killer space, just like the G7+ ThinQ did last year. The LG V40 has its volume rocker and a dedicated Google Assistant key on the left spine of the device. The right fascia houses the power button, whereas the bottom of the device features the 3.5mm headphone jack (and a bloody good one at that), a speaker grill and a Type-C port for charging. The handset also ships with a capacitive fingerprint sensor towards the back, which worked flawlessly during my testing. Thanks to its slightly wider chassis, the V40 ThinQ is able to squeeze in a bigger display which measures in at 6.4-inches. The display still ships with a traditional notch but as opposed to other similarly-priced handsets, the V40 ThinQ’s panel sports QHD+ resolution which makes it a godsend for consuming media on the fly. While that’s all good and dandy, I was the most excited for the panel’s OLED technology which, unlike the display on the G7+ ThinQ, exhibits vibrant colours and deep, dark blacks. Unsurprisingly, I didn’t notice any backlit bleeding around the edges and was satisfied with the display’s peak brightness level too. 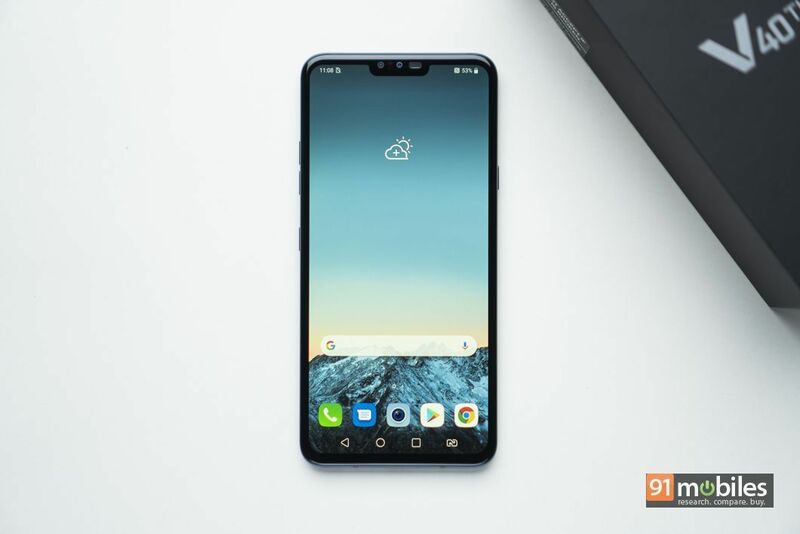 Coming to the specs, LG has furnished its latest flagship with Qualcomm’s Snapdragon 845 chip which works alongside 6GB of RAM and 128GB of built-in, user expandable storage. While the SD 845 is still an extremely capable chip, it will soon be replaced by the SD 855 platform in newer flagships which will be announced around MWC. That said, unless you’re a spec-head, the Snapdragon 845 processor powering the V40 will serve you just fine. During my initial stint with the device, applications opened swiftly and there was nary any lag when I was navigating through the UI. Speaking of which, the V40 ThinQ boots LG’s proprietary skin layered on top of Android Oreo, which is weird because it’s 2019 and Pie is where Android is at currently. I’ll talk more about the smartphone’s software features in my full review, but you can safely skip it if you’re all about running the latest OS on your brand-new smartphone. Now, you must be wondering – barring a bigger display, what exactly does the V40 offer over the G7+ ThinQ. Well, firstly, it also ships with a beefier battery which has a capacity of 3,300mAh. More importantly, the smartphone ships with a total of five camera sensors – two on the front and three on the back. That’s right, the V40 beat Samsung’s Galaxy A9 (review) to the punch as it was the first device to offer a penta-camera setup. 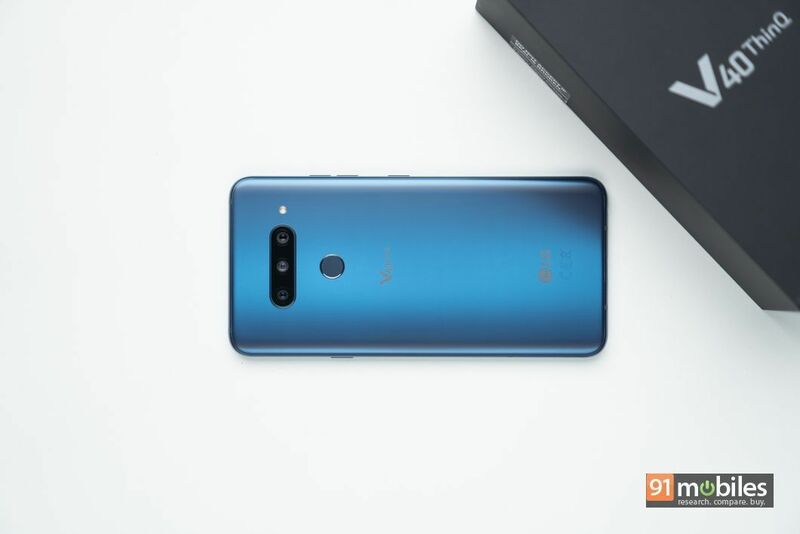 In terms of specs, the trio of sensors towards the back comprise a 12MP, f/1.5 aperture standard lens, a 16MP f/1.9 aperture, 107-degree wide-angle lens and a 12MP f/2.4 aperture telephoto lens. For selfies, the handset features an 8MP, f/1.9 aperture shooter which has been paired with a 5MP, f/2.2 aperture wide-angle lens. Now, I haven’t quite put the cameras to the test yet, but I plan to click a ton of pictures in the coming week with the smartphone. 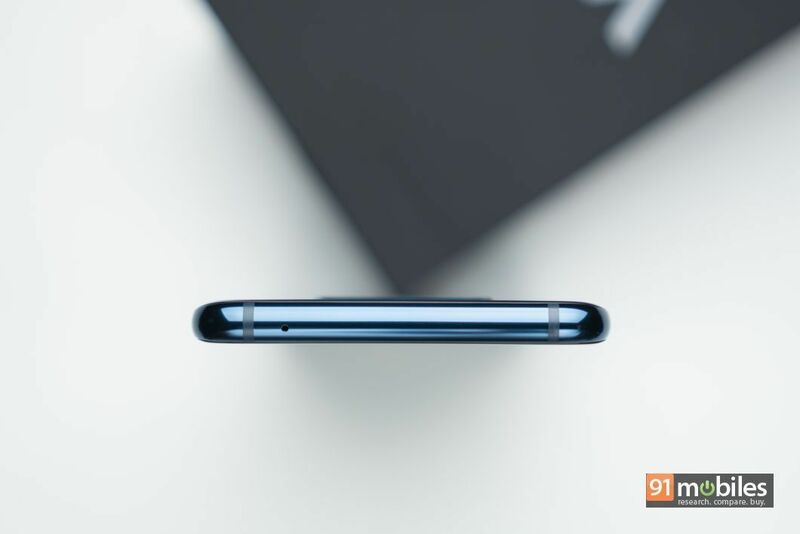 I’ll also compare its imaging prowess to the likes of the OnePlus 6T, which should give you a better idea of the handset’s capabilities in the photography department. So, sit tight and wait for our full review of the V40 to drop. 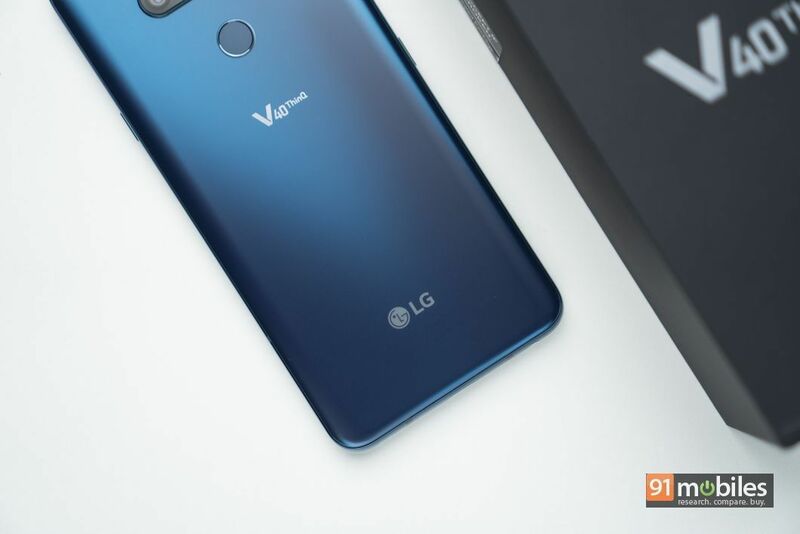 The LG V40 ThinQ is undoubtedly a stellar flagship and it has a lot going for it. However, with newer smartphones featuring more powerful innards just around the corner, I can’t help but think that the V40 has come a little too late to the Indian market. As it stands, the smartphone faces stiff competition from the likes of the OnePlus 6T (review) and the Honor View 20 (review), so it’ll be interesting to see if the tables turn in favour of LG’s offering. Our full review of the smartphone should resolve most of your queries, so stay tuned to our blog.